Is that how I love? 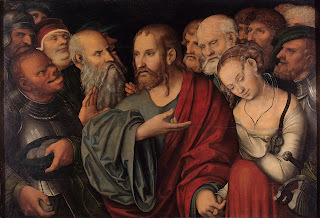 There is a painting of this scene done by Lucas Cranach; the Younger in 1507, now exhibited in the Hermitage at St. Petersburg. At the front center of the painting are Jesus and the woman. It’s the moment when Jesus turns toward the accusers and challenges those without sin to cast a stone. His expression is stern but troubled. The woman is not bowed to the ground in front of Jesus as in many paintings depicting this scene but is standing at his left. She is very young with eyes closed looking dejected and resigned to her fate. The most striking thing to me about this painting is that her right hand is entwined with the left hand of Jesus in a gesture of beautiful tenderness. The hands of mercy are joined to the hands of a suffering person. Jesus stood up in the face of that angry mob and courageously defended the sinner. When one gazes at this scene and sees Jesus and this woman you have to ask: Is this what our Church looks like to the world? Does the Church (and by the Church I mean do we, each one of us) like Jesus offer the sinner forgiveness and protection from condemnation? Or are we carrying around stones ready to judge and attack? Jesus shows us in this passage there is a right way and a wrong way to deal with sin: The wrong way is to be hypocritical and self-righteous and condemn the sin in others without recognizing that we too are sinners. The wrong way is to seek the destruction the sinner rather than their transformation healing and a new beginning. The right way is to forgive the sin in a way that will inspire in that person the desire for virtue and goodness. Jesus forgave and loved that woman in the middle of her mess. This woman had a whole pile of mess going on in her life that day, but Jesus decides to love her anyway. He loved her regardless of the sinful life choices she’d made. Forgiveness involves loving people in the middle of their mess. Let’s just be honest – life gets messy doesn’t it!? Jesus doesn't call us to love the mess people make of their lives, but he does call us to love the person. Jesus died on the cross because of our mess. I don’t know about you, but that’s a huge reason I was drawn to Jesus. It was because I felt He loved me the way that I am and not the way I’m supposed to be. And he challenges us to do the same. Love the people in our life the way he loved that woman is the message Jesus came to share with us. Jesus said: “A new commandment I give you: love one another ... as ... I have loved you…” (John 13:34) As I have loved” is the key phrase. Today we have an amazing example of how Jesus loves us. He defended the woman that day whose sin was public and obvious. He did not judge her but encouraged her to change her life. Today – in this story – we have a great model of how Jesus loved. As followers of Jesus Christ – as Christians – we are called to drop our stones of condemnation. We are called to love others the way they are, even in the middle of their mess. Who in your life needs that kind of love – a brother, a sister, friend, ex-husband or wife; someone who harmed you or a member of your family? We recently saw an amazing example of this played out right in front of us. Most of us recall the tragic shootings last summer that unfolded at Emanuel A.M.E. Church in Charleston, South Carolina. It’s not hard to remember the events that unfolded on that horrific day in June when a young man shot and killed nine people, as they sat in a prayer group at their church. But it was the day after the shootings where something remarkable happened; where we saw people acting like Jesus. It was at the arraignment hearing of the shooter where family members of the victims took the stand and one after another, looked right at the shooter, and offered forgiveness. They offered forgiveness! They offered forgiveness to one who in society’s eyes didn't ever deserve it With a shaky voice and a quivering lip one elderly lady even invited him to her Wednesday night, small group. It was astounding to hear those words. Do you know what I think we were witnessing during that arraignment hearing? We saw what happens when heaven comes to earth. Through those precious followers of Jesus in Charleston South Carolina, we got a glimpse of heaven touching earth. We saw Jesus in them. That’s what it looks like to be a follower of Jesus Christ. There are people today in our lives who desperately need to hear of Jesus’s love and forgiveness. If we don’t tell them who will?